See why our team of Fools believes that IBM, M&T Bank, Moody's, General Electric, and Phillips 66 are great Buffett stocks to buy as we head into 2017. Warren Buffett is one of the most widely followed investors in the world, and it's not hard to figure out why. Buffett's acumen for identifying winning businesses helped grow Berkshire Hathaway's (NYSE:BRK-A)(NYSE:BRK-B) book value by more than 19% annually over the past five decades. That's an unbelievable track record that almost no one else can match. For that reason, many investors regularly comb through Buffett's holdings to identify winning stocks to buy. Knowing that, we asked a team of Fools to highlight a Buffett stock that they believe is a strong buy as we head into the new year. Read on to see why they picked International Business Machines (NYSE:IBM), M&T Bank Corp. (NYSE:MTB), Moody's (NYSE:MCO), General Electric (NYSE:GE), and Phillips 66 (NYSE:PSX). Jamal Carnette, CFA (M&T Bank Corp.): It's been another great year for Warren Buffett, with Forbes reporting that he added $12.3 billion to his personal fortune, more than any other U.S. citizen. In a small bit of irony, even though Buffett supported Hillary Clinton for president, the Oracle of Omaha saw his majority of his gains after the election of Donald Trump. Buffett's rocketing net worth post-election was aided by portfolio positioning. As of this writing, approximately 35% of Berkshire Hathaway's portfolio is in financials. 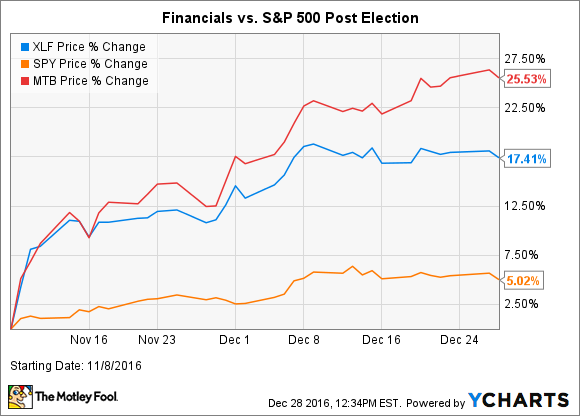 The financial industry has enjoyed a favorable post-election run, with the financial index increasing at a rate of three times the broader S&P 500 Index. M&T Bank has increased at a rate of more than five times the index during the same timeframe. For financials, it's not simply "animal spirits" powering their returns. Since Donald Trump's election, the yield curve has significantly steepened, with the benchmark five- and seven-year yields increasing at a higher rate than other maturities. This benefits banks that lend funds to consumers at those maturities while paying interest to depositors at the lower maturity yields. A steepening of the yield curve should power higher earnings in the upcoming quarters as net interest margin improves. Data source: Treasury.Gov. Figures in percentage points. Higher net interest margin rates will especially come as good news for M&T Bank's shareholders. Last year, the company (finally) closed on the Hudson City Bancorp merger. While M&T received a significant deposit base with the transaction, there was a cost associated with the purchase. Hudson City Bancorp's interest deposits were higher interest and were a drag on the company's net interest margin. A steeping yield curve partially rectifies this situation. Additionally, the incoming Trump administration has strongly hinted that it plans other bank-friendly actions, such as lowering the corporate statutory tax rates and repealing many, if not all, facets of Dodd-Frank legislation. Combined, these moves should lead to continued strong returns for M&T Bank Corp.
Todd Campbell (IBM): 2016 may go down as the year in which International Business Machines' transformation into a cloud, analytics, engagement, and security giant began paying off for investors, including Warren Buffett, whose Berkshire Hathaway owns 81.2 million shares. Although IBM's slow-growth legacy technology products and services still took a toll on its top line this year, enthusiasm for Big Blue's fast-growing "strategic initiatives" propelled shares 26% higher this year. As of the third quarter, sales from strategic imperatives surpassed an annualized $32 billion, including cloud revenue, which exceeded an annualized $13.5 billion. Since industry watcher Gartner estimates that the cloud services market was worth $208 billion in 2016, there's still plenty of market share for IBM to capture. Despite its legacy headwinds, IBM remains handsomely profitable, and a track record of dividend increases (21 in a row) suggests that income-oriented investors ought to consider adding this stock to portfolios. In 2016, IBM increased its dividend payout by 8%, and with analysts targeting EPS of $13.90 in 2017, up from $13.50 in 2016, there's a good shot we'll see management announce a similar dividend increase in the coming months. Tyler Crowe (General Electric): General Electric is nowhere near what you would call a large holding in the Berkshire Hathaway empire, but there are a lot of reasons to think that Berkshire plans to hold on to those shares in the coming years. Now that the company has completed its plan to shed the vast majority of its financial assets, it's now a much more focused company, built on two pillars for the future: manufacturing industrial products and using its Industrial Internet of Things platform to make those machines run more efficiently. Based on early results from General Electric's Predix software platform, it has shown it can generate lots of value for clients in predictive maintenance and process optimization -- so much so that the company foresees just its GE Power customers saving $390 billion in maintenance over the next 10 years with its Asset Performance Management app. For General Electric, incorporating remote sensing, real-time data analysis, and its homegrown software and cloud storage systems brings two major positives to the table. One is a new recurring revenue source from Predix subscriptions. By 2020, GE estimates that Predix will be a $15 billion business by itself. The other major positive is that by showing improved performance through its software and analytics capabilities, it makes its current industrial product offerings that much more attractive for potential customers. That one-two punch has the potential to do great things for GE's bottom line and certainly makes it a Buffet stock worth watching. Matt DiLallo (Phillips 66): Oil refiner Phillips 66 has invested billions of dollars in capital over the past few years to grow its midstream and chemicals businesses. These investments are starting to pay off and should deliver meaningful earnings growth this year. For example, the company recently completed its Freeport LPG Export Terminal, which will allow it to export liquefied petroleum gas to lucrative global markets. That project was part of a $3 billion investment in midstream growth that the company launched in 2014 to maximize the value of its existing infrastructure and grow earnings. In addition, Phillips 66, Energy Transfer Partners (NYSE:ETP), and Sunoco Logistics Partners (NYSE:SXL) are waiting for the removal of a final road block so they can complete the $4.8 billion Dakota Access and Energy Transfer Crude Oil pipelines. Once complete, the system will enhance Phillip 66's access to oil from the Bakken shale. Finally, the company has several other midstream projects nearing completion, including the expansion of its Beaumont Terminal and the Bayou Bridge Pipeline. These projects will enhance the access of North American crude to the Louisiana market and should provide Phillips 66 with steady fee-based cash flow over the next several years. Meanwhile, Phillips 66's chemical's joint venture CP Chemicals is nearing the completion of its Gulf Coast petrochemicals projects. These facilities will increase the venture's production capacity by a third and significantly boost its earnings potential. With so many major projects winding down, Phillips 66 anticipates that capex spending will fall by nearly $1 billion this year. As the same time, cash flow should rise as these projects go into service. This shift should mean that Phillips 66 will generate a meaningful amount of free cash flow that it will probably return to investors in the form of a higher dividend and additional share repurchases. Those growing shareholder distributions have the potential to push the stock higher this year, making January a great time to buy this Warren Buffett stock. Brian Feroldi (Moody's): Buffett has been a happy shareholder of the credit rating agency Moody's for years. This company has long been a leader in its industry, and it primarily earns its revenue from fees associated with providing ratings on public and private debt. This is a highly lucrative business that earned strong returns on capital. Better yet, the company requires almost no incremental capital to grow. That allows Moody's management team to stay laser focused on using its stream of cash to reward shareholders. 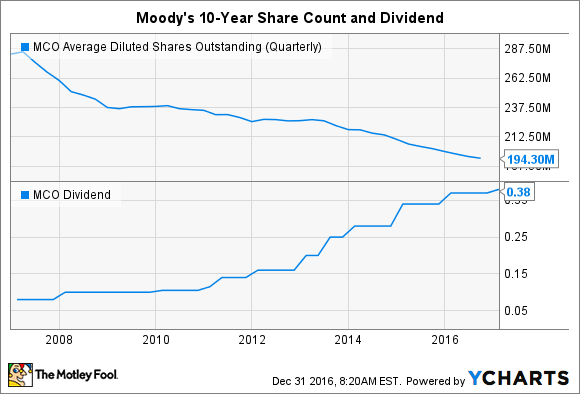 Have a look for yourself at what's happened to Moody's share count and dividend over the past decade. Looking ahead, I think investors can expect more of the same. Through the combination of price increases, bolt-on acquisitions, and a gradual rise in the demand for debt, Moody's should be able to put up consistent revenue growth. Add in the company's healthy appetite for buying back stock, and I think the company should be able to put up double-digit gains in earnings per share. That's an attractive combination for a stock that's trading at only 21 times trailing earnings and offers up a dividend yield of 1.6%, making this a great stock to buy in the new year.